A short story that appeared in a number of Sailing Magazines, such as GAM and Ontario Boating about our previous boat “A lil’ R&R” the trailer sailor that really got us into sailing and adventuring. Dagger board up, draft of 12 inches. Almost beached in Georgian Bay. 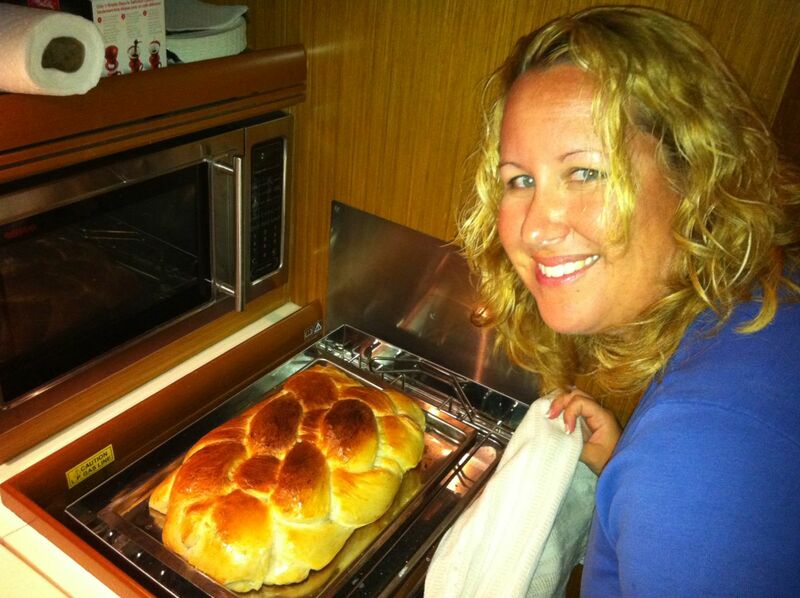 Flexibility is what Ed Radonic and his family were looking for when they purchased their 26’ MacGregor in 2005. The ability to quickly arrive at a new location to and have the maximum time to explore is what Ed and his wife Roxane find so appealing about their trailer-sailor. 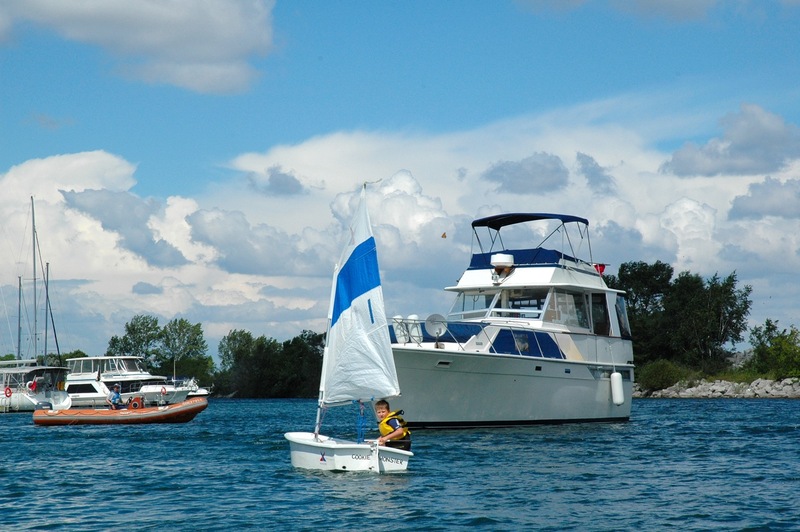 Being members of Port Credit Yacht Club in Mississauga, allows this family the opportunity to freely explore the Lake Ontario area. Some of their favourtie cruising destinations in Lake Ontario have been Centre Island, in Toronto, Fifty Point in Stoney Creek and across the Lake to Wilson, NY. However, unlike most other sailboats, with their trailerable boat, they have had the opportunity to reach locations outside of Lake Ontario on a much more frequent basis. In addition to this, the MacGregor has a completely retractable centerboard giving the boat a 12” draft, this allows the boat to get into areas that others sailboats cannot. This shallow draft also gives the boat the opportunity to be beached or come close enough to the beach that you can step out into knee-deep water. The Radonic’s have taken advantage of this many times at beaches in Georgian Bay. The beaches on Beausoleil, Beckwith, and Christian Islands are some of the favourite destinations for the Radonic children, Thomas 7, and Alexander 4. As Thomas said at the age of 5, “I wake up in the morning with the lake as my frontyard and the beach as my backyard!” “Each and every time we arrive at a beach without fail every boater in the area shakes their head as we approach the shallow waters. Assuming that our boat has a fixed keel they stare at us in wonderment waiting for us to go aground” explains Ed. Having young children, the Radonic’s plan two, seven-day trips to Georgian Bay each summer. In Georgian Bay, they can enjoy beautiful sailing, quiet beaches that are only accessible by boat, plus their kids have found a new love: hiking the trails on Beausoleil Island. They do not just limit themselves to Southern Georgian Bay; in 2005 they sailed in the Parry Sound area, making their way up to Britt and up the Key River. “In the rocky waters of Georgian Bay the retractable centerboard definitely comes in handy” says Ed. Also in 2005, they launched their boat in Midland and sailed in perfect conditions to Collingwood anchoring at some of their favourite islands/beaches along the way. In Collingwood, they stayed at the Cranberry Resort Marina, which gave them access to the pool and resort facilities. There was no time relax on this trip, with two small children they took a taxi to Intrawest Village, to the splash pad, they toured the Scenic caves and went on the Suspension Bridge. In 2006, they kept their mast down, motored from Midland to the Severn River, and went over the Big Chute Marine Railway with their boat. This was an exhilarating experience for the children. Being portaged up hill, over land, on rails, in their boat, is definitely an experience they won’t forget any time soon. Continuing up the Severn River through several Locks, they made their way through Sparrow Lake to Lake Couchiching. Last summer they took the MacGregor up the Trent River through Rice Lake and up the Otonobee River to Peterborough. This incredible trip began in a small town called Trent River. Ed decided that he did not want to waste the day traveling, so instead of beginning the family trip on Friday morning as planned, he wanted to leave on the Thursday night. By the time, he down-rigged the mast (which he has become extremely proficient at) and got the family in the car with all the gear needed for a week on the boat, it was 9:00 pm. They headed out in the dark to a place that seemed to be in the middle of nowhere. Earlier, Roxanne, being the planner, had found a public boat ramp in this small town, and with a few phone calls, she decided that it would work for the length and weight of their boat. Following their GPS, they arrived in Trent River without any trouble. Ed took his flashlight with him and walked down the boat ramp into water above the knee to check out the condition of the ramp and depth of the water. After determining that it was all-good, by the light of one streetlight they successfully launched the boat without incident. They were able to tie up on the concrete wall. They transferred their two sleeping boys to the boat along with all their gear and food and spent the night on the wall. In the morning, Ed woke up early and drove their van to Peterborough, as this was going to be their final destination. Ed then took a taxi back to the boat and by 10:00 am, they began their journey to Campbellford. Leaving their vehicle and trailer at their final destination allowed them to travel twice as far, because they did not have to return to their starting point. Campbellford was a lot of fun, with great restaurants and great scenery not to mention an amazing bakery. Ranney Falls, and Healey Falls were beautiful but riding the Hydraulic lift lock in Peterborough was definitely a highlight. One thing Ed noticed is that through all of his rigging experience, he has learned a lot about fine-tuning his mast and sails. Many experienced sailors at his yacht club have admitted to him that they have never rigged a boat before. Ed can completely down-rig the sailboat in approximately one and a half hours, (this includes having the mast completely secured for trailering). He doesn’t always look forward to this work, but it always ends up being worth it, allowing the family the opportunity to explore a new location that they wouldn’t have otherwise gone to. One of the family’s longer distance trailering experiences includes a trip to New York City. On this trip, they sailed past the Statue of Liberty and completely around the island of Manhattan. They continued down the coast of New Jersey for a few days then on the way home they launched the boat into two different Finger Lakes in New York State to explore this beautiful cottage/wine country. “Trailering has definitely cut down on our travel time and allowed us to experience more time sailing at our destination,” said Ed. In fall, 2007 the Radonic’s trailered their MacGregor to Halifax, Nova Scotia. Launching the boat in the ocean was a very different experience from launching the boat into a fresh water lake. They now had to take into consideration the tides. The boat could only be launched during high tide. During low tide the ramp was long and completely covered in slippery green algae. It would have been virtually impossible to launch or pull their boat out of the water in these conditions. Keeping careful track of the tides, they were able launch and pull the boat out without any problems. Future travels for the Radonic’s includes a trip to the North Channel. They plan to begin this cruise by trailering their boat to Little Current, ON. This adventure will continue westward towards the many uninhabited islands and unspoiled anchorages. Here their adventures in trailer sailing will continue. Music Video Filmed Aboard Black Diamond – Party Party X2 Bonjour Hola! I read the article in the Summer 2012 L’Escale. We also have a MacGregor 26M and have trailed it outside our yatch club. I read that you removed the mast and motored. I was wondering do you maintain the water ballast then? I would be cheaper on fuel but maybe too tipsy? The Macgregor is more stable without the mast up, since you don’t have weight high aloft. If you have the mast up, especially sailing, You should have water ballast fully loaded. When the mast is down and you are motoring, the water can be fully released, this will allow the boat to plane, like a traditional power boat. I do recommend a little bit of water in the ballast tanks, even when motoring for added stability. However you will get much better fuel officially with empty tanks. I do want to send a strong warning about running especially sailing with no or not enough water in the tanks. The boat becomes very unstable, and will not right itself. I want to share a story, because it could save your life. I was motoring with my Macgregor, so I had the tanks empty. There was not wind. I decided to put some sail up, like traditional boats do when they are motor sailing, for added efficiency, an extra knot or two of boat speed ect. “DO NOT DO THIS WITH THE MACG, WITHOUT WATER IN THE BALLAST TANKS!” All of a suddden a little wind gust hit us, and the boat went right over, the crew hanging off the rail, with the motor running on full power. Luckly no one fell off the boat! THe boat would not right itself, we had to stop the motor, pull down sail, and try to balance the boat with no ballast. Almost lost the boat. Worse than that, had we fallen off, the boat would have kept going and we would have been left to die in the middle of Lake Ontario in very cold waters, in the middle of May!